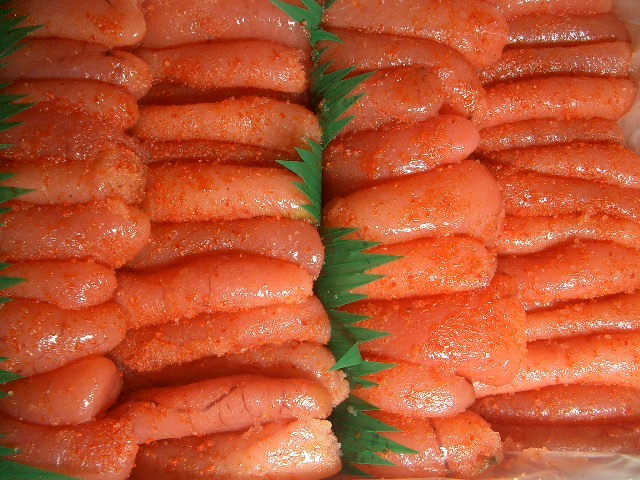 As much as I love Cod Whiting (“Shirako”), I have some reservations about Cod Roe or “Tarako”. 2) pickled in chili pepper, a very popular delicay in Japan under the name of “Mentaiko”, which originally came from Korea (“myonte”). If it is fresh I appreciate grilled over charcoal until it becomes pink dry in the middle. “Mentaiko” can be bought at any good supermarket or fishmonger. It does come in many varieties and fluctuating quality. 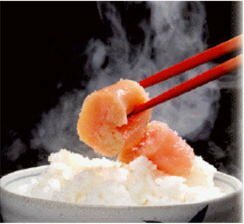 Although most cod is caught off Siberia and North America, mentaiko is of course prepared in Hokkaido, but also in Kyushu. 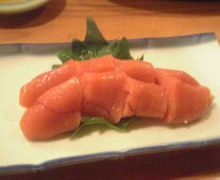 Actually “mentaiko” represents 70% of all “tarako” sold as it is easy to preserve. When you choose a pack, ascertain there is no water under it and that the colour is even and shiny (which means the outer “skin” is fine). As for sushi, there are many possibilities with maki filled with mentaiko and raw squid (“ika”=ikamentaiko maki), mentaiko with cucumber sticks, etc. 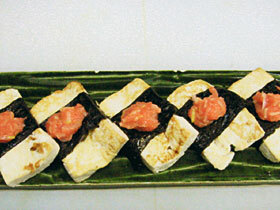 the “shari” (rice ball) is topped with a slice of grilled tofu, then secured with a strip of “nori” (dried seaweed) and topped with fresh mentaiko. Mind you this a favourite for my better (worse?) Japanese half, not for me!